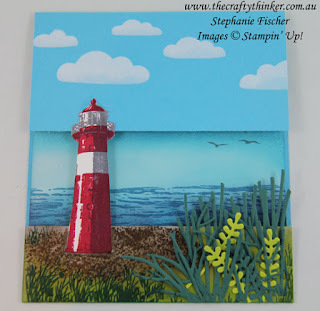 Welcome to the Stampin' Dreams Blog Hop, running monthly. You are currently visiting Stephanie Fischer from Australia. 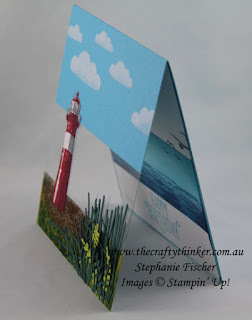 I hope you enjoy my card showcasing one of my favourite Carry Over Products from the old catalog to the new one. 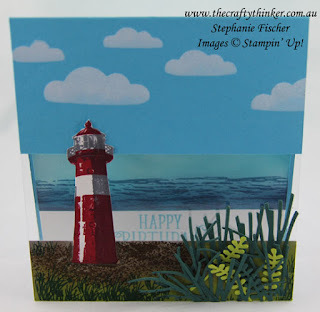 I have chosen to use the High Tide stamp set, which is so good for masculine cards and this will be my card for my husband's birthday! I have paired it with some of the great new products in the catalogue. For the clouds, I used the new Pattern Party masks and dabbed on several layers of Whisper White Craft ink with a sponge dauber - adding more white to the top of the clouds. I cut off a little more than half of the front of the card and replaced it with a piece of Window Sheet to which I added a strip of Sahara Sand at the bottom. I stamped the Sahara Sand strip with the rocks/pebbles with Soft Suede ink and then sponged that area with some Crumb Cake Ink. I sponged the rest of the strip with Lemon Lime Twist and stamped some grass with Tranquil Tide ink. I then cut some of the foliage from the Bouquet Bunch framelits in Tranquil Tide and Lemon Lime Twist card. I trimmed the Tranquil Tide pieces and then added the pieces, overlapping them, with the help of the Fine Tipped Glue Pen. I had previously stamped the lighthouse onto Whisper White cardstock with Basic Gray and Real Red inks and cut it out. I glued it into place on the front of the card. 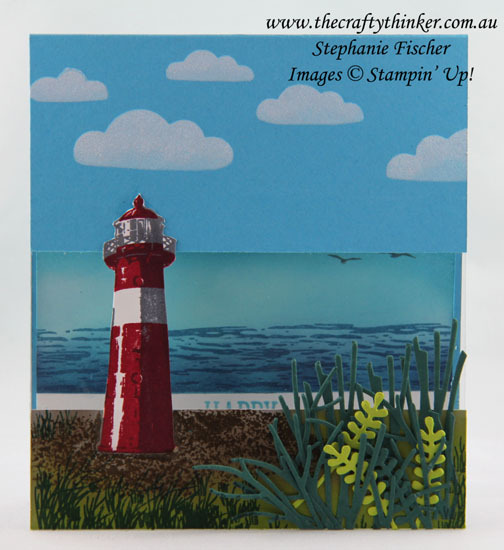 I cut a piece of Whisper White cardstock to size for the inside of the card, masked off the area I wanted to colour and then sponged with Tempting Turquoise ink with a touch of Night of Navy towards the bottom. 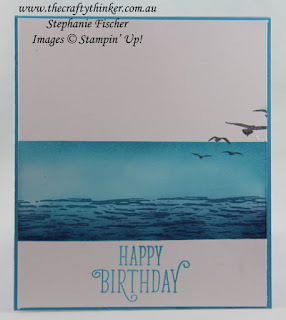 I then stamped the sea with Pacific Point ink and added the birds with Basic Gray ink. 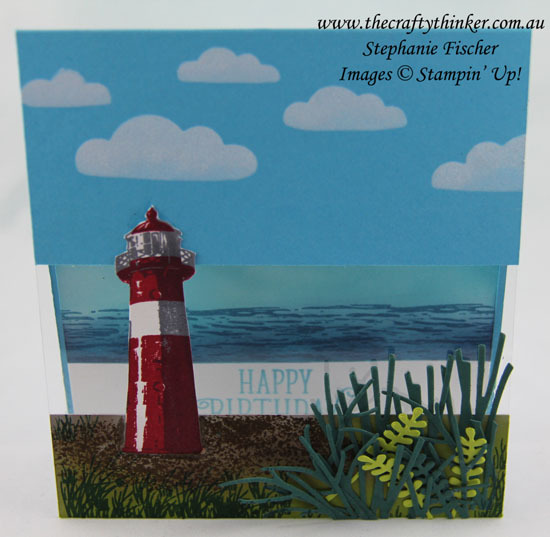 If I repeat this design, I might take the sea further down the inside panel so that only sea is showing when the card is standing open. The birthday greeting is from the Happy Birthday Gorgeous stamp set and is stamped with Tempting Turquoise ink.